Silicon vs. Carbon – Is Hyper-Connectivity Making us More Disconnected? Now that the Floyd Mayweather vs. Manny Pacquiao boxing fiasco is behind us, let’s chat about the real “Fight of the Century” better known as Silicon vs. Carbon. Quick chemistry refresher: life doesn’t exist without Carbon so that represents personal face-to-face communication with other people. Things are made of Silicon so that represents personal device communication with other people. 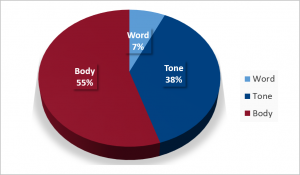 Landmark research by Albert Mehrabian says 55 percent of communication is body language, 38 percent is tone of voice and only 7 percent is the spoken word. One could argue 93 percent of communication is nonverbal and that should impact your view of Silicon vs. Carbon. Me personally? I’m close to zero silicon. I’m probably the worst on personal devices. I could be called a Luddite (someone who resists using new technology) most days. Everywhere I go, I see people spending a lot of time making sure they have the very best hardware and software. And then they spend a lot of time trying to deploy that best hardware and software. And then they spend a lot of time watching tutorials and learning the hardware and software through trial and error. That is a lot of time in case you didn’t notice. The next hipster trend will be to step back from the personal devices and step up to more personal connections. I am in no way proposing that we rid ourselves of all technology. I’m not about to propose an either/or situation or a gimmicky “personal device day off.” I’m just saying if you spend untold hours perfecting a spread sheet but zero time thinking about whether or not there are cognitive biases behind the data that is in that spread sheet, then you are missing some truly game-changing knowledge. You are making business decisions based on imperfect information. The same can be said for all those transactions you make via text or email – imperfect information. Now I’ll admit texting and emailing is not verbal, but I must also say texting and emailing is not nonverbal. No matter how sophisticated today’s communication device is, if you are texting or emailing someone, you cannot detect the subtleties that give away what they really mean when they provide you answers or feedback. My recommendation to you is to have a policy where you spend at least some time each day communicating with people face-to-face. That is one of the reasons I spend more than 200 days every year traveling – I can learn more about a person in one face-to-face meeting than I can in weeks of texting and emails. So make that lifestyle change today – get out there and have lunch or dinner or drinks with someone in person. Now even though the author is talking about temperature and not hipster levels – I predict a major change in the future. The next hipster trend (once large glasses and long beards become passé) will be to step back from the personal devices and step up to more personal connections. Stay tuned – the Silicon vs. Carbon battle is just heating up.